The best part of marrying into a Brazilian family is the food – I mean the family and the love(!) – and the food ;). I mean, who doesn’t love pão de queijo?? 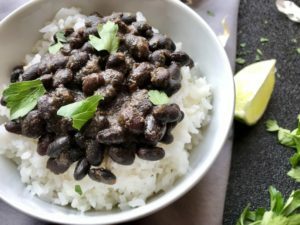 These Slow Cooker Brazilian Black Beans, known as Feijão, are a traditional dish in Brazil. 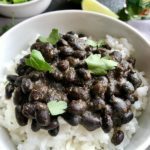 The slow cooker makes it incredibly easy to make these anytime and it allows all of the flavors from the meat, onion, cilantro, and garlic to cook into the beans for a distinctive, thick, saucy, and hearty dish. They are great as a side or a main dish. If you have never tried these beans, you really MUST and I promise you will love them. I met my husband Dave (David at home with his family), when we were both studying in Boston. We started dating in 2001 after we both moved to New York. I met his parents in 2002, when Dave brought me to his home in Alexandria, VA to visit. His mother, Etelvina, was born in Portugal but raised in Rio de Janeiro and her mother taught her to make these amazing Black Beans. It was during this visit that I had my first experience with these mouthwatering, delicious Brazilian Black Beans that were cooked lovingly for hours by Dave’s grandmother. This slow cooker version is so easy! If you do not already have , I HIGHLY recommend them! 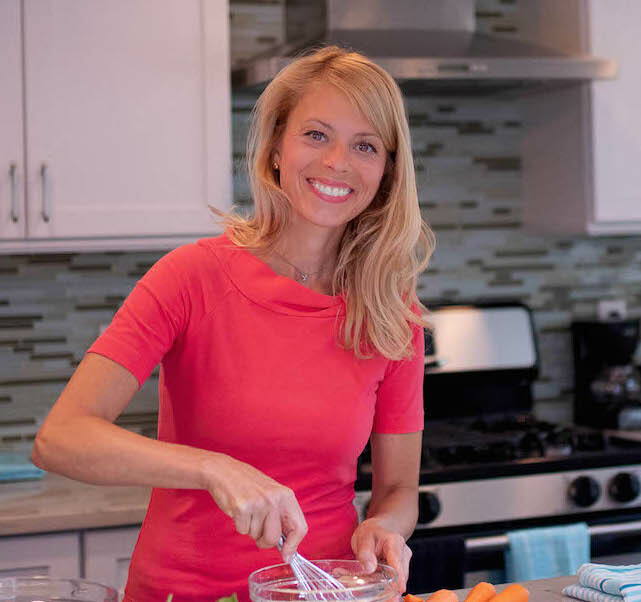 I love my 6-Quart Crock Pot! After soaking the beans overnight and then blending up the onion, garlic, and cilantro (could it be easier?? ), you simply add everything to the slow cooker and let it work it’s magic. Take the beans out and serve over rice and enjoy!! 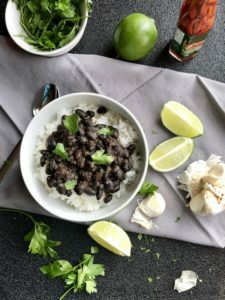 These Brazilian Black Beans, known as Feijão, are an absolutely delicious traditional dish in Brazil. The slow cooker makes it incredibly easy and allows all of the meat, onion, cilantro, and garlic flavors to cook into the beans for a distinctive, thick, saucy, hearty dish. The night before, pick through the beans to make sure there is nothing unwanted. Add the beans to a large bowl and cover with water. Soak overnight. When ready to cook, drain the beans. Put the garlic, onion and cilantro with 2 tbls water in a blender and purée it until all minced. Add another tbls of water if needed. Cut the chorizo into ¼ inch slices. Into a slow cooker, add the ham hock, chorizo, beans, beef bouillon, the puréed mixture, bay leaf, and salt and pepper to taste. Cover with enough vegetable broth to cover the means, about 4-5 cups. Let cook for 8-10 hours. While the black beans are cooking, when you are getting ready to eat, make the rice according to package instructions. scoop beans over rice and enjoy as a main dish or a side to steak or sausage. Enjoy!